Alejandro's Libros: The King Victorino. 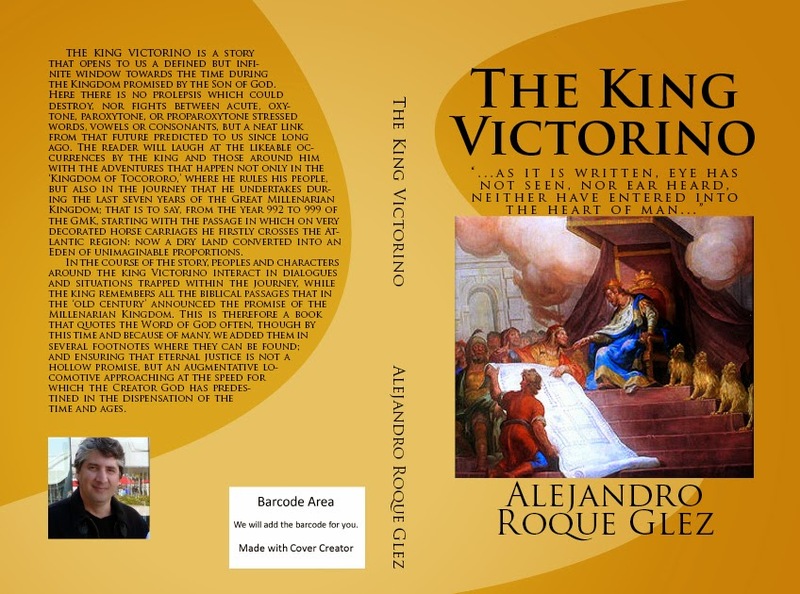 THE KING VICTORINO is a story which opens for us a defined but infinite window towards the time during the Kingdom promised by the Son of God. Here there is no prolepsis which could destroy, nor fights between acute, oxytone, paroxytone, or proparoxytone stressed words, vowels or consonants, but a neat link from that future predicted to us since long ago. 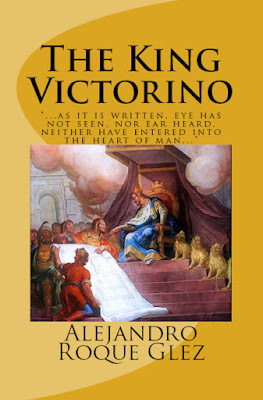 The reader will laugh at the likable occurrences by the king and those around him with the adventures that happen not only in the 'Kingdom of Tocororo,' where he rules his people, but also in the journey that he undertakes during the last seven years of the Great Millenarian Kingdom; that is to say, from the year 992 to 999 of the GMK, starting with the moment in which on very decorated horse carriages he firstly crosses the Atlantic region: now a dry land converted into an Eden of unimaginable proportions. In the course of the story, peoples and characters around the king Victorino interact in dialogues and situations trapped within the journey, while the king remembers all the biblical passages that during the 'old century' announced the promise of the Millenarian Kingdom. This is therefore a book that quotes the Word of God often, though by this time and because of many, we added them in several footnotes where it can be found; and ensuring that eternal justice is not a hollow promise, but an augmentative locomotive approaching at the speed for which the Creator God has predestined in the dispensation of time and ages. -Prologue by the scribe Euqor. -Chapter א (Aleph): The King Victorino and the Queen Angelike. -Chapter ב (Beth): The Kingdom of Tocororo. -Chapter ג (Gimmel): The Seven Years Journey. *Departing Tainotixtán and Sketch of the Journey. *The Kingdom of the Atlantic Flower and The Queen Snowhite. *The Kingdom of Stratford and The Palace of Romeo and Juliet. *The Kingdom of Salamanca and The Castle of Don Quixote and Sancho Panza. -Chapter ד (Daleth): Returning to Jerusalem through the Pillars of the Alpha and the Omega. TAGS: Kingdom of Tocororo, Caribbean, Atlantic, Kingdom of the Atlantic Flower, England, Spain, Europe, Jerusalem, John the Baptist, Solomon, David, King Christ, King Victorino, Kingdom of Stratford, William Shakespeare, Kingdom of Salamanca, Don Quixote, Sancho Panza, Mediterranean, The Pillars of the Alpha and the Omega, Gog, Magog, Prophets, Israel, Millenarian Kingdom, Genghis, Snow White, Prophets, Literature, Poetry, History, Messiah, King Christ, Final Judgment, Eternity, Aleph, Beth, Gimmel, Daleth, God the Father Coming. The digital version (eBook with DRM) can be found in: Amazon, Barnes & Noble, and Apple_iTunes (iBookstore). Puede encontrar la versión en español de este libro aquí: "El Rey Victorino".